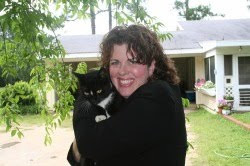 Cool Cat Teacher Blog: Thank You! Flat Classroom book ordering goes live! Thank You! Flat Classroom book ordering goes live! Sometimes you have to take a moment to say thank you. This is one of those moments. 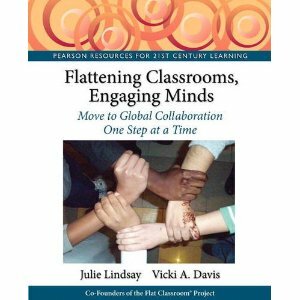 Julie just skyped me that our link went live on Pearson's website for Flattening Classrooms, Engaging Minds and I saw that it is really going to happen. I was asked last week what social media has meant to my life and career. What it has meant is everything. You see, I'm this person who likes to write and lives in Camilla, Georgia, a tiny town of 5,500 and shrinking. I have three kids and spend most of my time as taxi driver and chef. But every morning since I've been about 12 I have written 3-4 pages in my journal and dreamt of being an author. Someone who would inspire that would help others live better lives. I wanted to help other people know that you can live a good life. When I started teaching after leaving the business world I fell in love with the nobility of it. The fact that lives can change because of one amazing teacher. I want with all my heart to be one of those amazing teachers and I want others to be that teacher too. We screw up all the time because we are human and tired and I want teachers to know it is OK and to get back up and dust off and that you can do it. I've been at the point where we had to count quarters to find enough money to buy milk and that when your wallet is tight it is hard to put on a happy face and teach kids. Wallets have been tight for a lot of us lately. "who do you think you are that anyone would listen to you?" "I don't know who I think I am but I know I am a teacher and I'm just writing to other teachers. I love it and it is what I'm called to do." But today is about you. It is about you because without you following and reading this blog, no publisher would have ever darkened my door or talked to me. No one would even think about letting some person from a small town at a small school in rural Georgia write about cutting edge technology. But you decided you wanted to listen to me. You decided you wanted to "like" me, "friend" me, and "follow" me and for that I am so grateful. 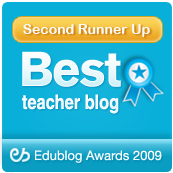 This blog saw the birth of the Flat Classroom project with a message from Julie Lindsay. I've liked and followed and talked to you too because you are amazing and we are in a great conversation that can improve all of our lives if we let it. Thank you for what you all have done for me. The comments, the sharing, the tweets. Everything you've done. Even if you're a "lurker" and you follow my RSS feed that is enough to help publishers see that there is an interest in what this country girl has to write. I just have to say thank you to you. I also have to thank God, He made and called me for such a time as this. I believe that with all my heart.